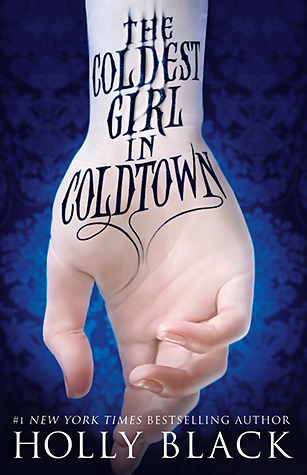 The Coldest Girl In Coldtown is based on the world created in Holly Black's short story of the same name. I reviewed this short story a few months ago so I had some insight going into the novel. Coldtown follows the story of Tana, a teenage girl living in the not too distant future were Cold is the new black.Vampires are no longer in hiding and for the past ten years have been quarantined in Coldtowns. These seemingly extravagant , glamorous, and fantastic towns draw in young adults looking to become vampires ; to be turned cold, to die, to live forever. But once you go into Coldtown there is no going back and not all is what it seems in Coldtown. When Tana wakes up the morning after a party she finds everyone murdered by rogue vampires. That is except herself, a crazy rambling vampire named Gavriel and her ex-boyfriend , Aiden. After a near miss Tana fears she may be going cold and finds herself on a journey to Coldtown. I found the the publication of this book. . . interesting. It seems the days of vampire YAs has come and gone. Which can only mean that whatever formula Black has come up for vampires must be a fresh one and it certainly is. Black blends the classics of vampirism with a few dystopian-ish /City Noir elements. Suddenly sinister plots are revealed, plot twist happen and danger is around every corner. Coldtown becomes a dark gritty city full of promises and lies. Then it just gets a bit confusing. There is suddenly so much going on and the fact that the main story is told only Tana's POV limits the readers understanding of all the events. Tana felt more like the audience surrogate as the other plots started unfolding round her, she doesn't really have any stakes (lol, get it ?) in the events. As for the characters I liked Tana, she doesn't seem overly insecure but she's also not perfect. As you can imagine Gavriel, the rambling vampire, becomes some what of a love interst for Tana. He was certainly a character and I liked how Black wrote his ramblings. This was one of the times where I wanted there to be more romance between the characters. They have a few scene together but I wanted a few more. What stands out the most about this book is how modern it takes the idea of vampires. Black taps into our media hungry culture showing how young people become fangirl/boys of the vampires. Instead of outright fearing vampires they become internet sensations, TV specials and the buzz of social media. Like in the short story the use of social media plays a big part in this story. Sites like Tumblr (even gifs), Flicker, Livestreams and what could be Twitter get a shout out. The characters use these tools to talk to each other about Coldtown and prep those who want to get in. Although I will admit a part of me wonders if this will "date" the novel 10 years from now. This novel is going to be a duology so I'm intrigued enough by the world of Coldtown to read the second book. I'm hoping for a little bit more plot wise, but this is a great book to grab for vampire fans. Overall the novel is a twist on the old vampire stories with a mix of a Dytsopian with an Urban Fantasy vampire element thrown in. The novel is high on world building, but what worked well in the short story just didn't translate into a full length novel. social media and a fresh take on vampires. Sign me up! Plus, I really like the cover to this book. I also love your new design. What did you use to make it? I am looking to make a new design and possibly moving over to wordpress but Im not sure where to start exactly. The cover is pretty great. For the blog design I grabbed the background from backgroundlabs.com. I made the header and blog buttons in Photoshop 7 using the fonts Chunk Five and Sverige Script which are all free. I had to do a lot of googling to get the blogger header to sit the way it does. E-mail me if you want more details ! I think Tana is a middle of the road character. It's not that she was un-likable but I didn't find her SUPER likable.